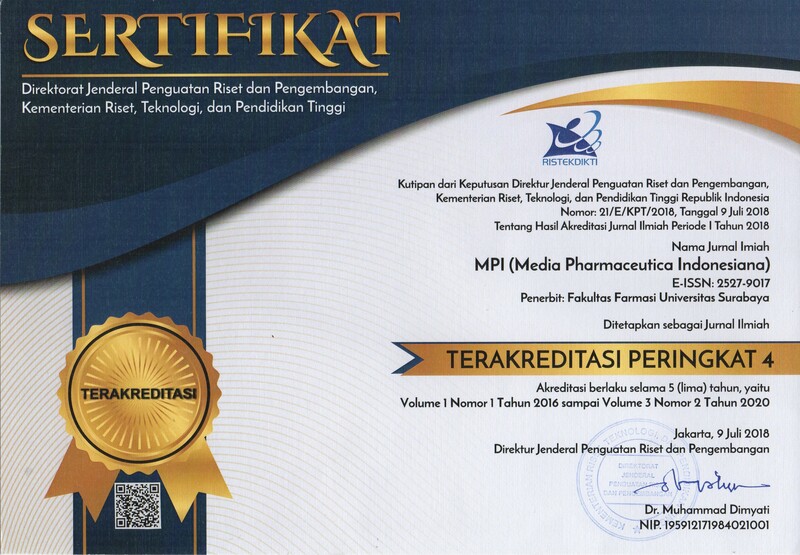 Media Pharmaceutica Indonesiana (MPI) publishes papers (in Bahasa Indonesia and English) reporting the results of original research, short communications and critical reviews on all pharmaceutical fields. It covers a wide range of pharmaceutical biology, pharmaceutical chemistry, pharmaceutics, pharmacology and toxicology, community and clinical pharmacy, pharmaceutical microbiology as well as other researches related to the pharmaceutical issues. The papers should report the results of original research and manuscripts have not been previously published elsewhere and should be exclusively submitted to the MPI. Further requirement for this type of paper please refer to point 6 (Preparation). Review articles should provide concise and critical updates on a subject of current interest. Authors should contact the editor in chief or managing editor before submission to ensure possibility for publications. Short communications is a concise but complete description of a limited investigation (experiment). This type of paper should not occupy more than 8 manuscript pages, including figures, tables and references. All authors are requested to disclose any potential conflict of interest including any financial, personal or other relationships with other people or organizations. Investigations using human and/or experimental animals must state in the methods section that the research was conducted in accordance with the internationally accepted principles and was approved by the institutional human or animal experimentation committee or equivalent, and that informed consent was obtained. Manuscript should be written with Arial font number 12, double space, maximum 20 pages on A4 paper with margin 3 cm from all sides. Every line and page should be numbered. Divide your articles into clearly numbered sections and sub sections (1, 1.1, 1.1.1; 2, 2.1, 2.1.1, etc.). The files should be saved in the native format of the word processor. The text should be in a single-column format. Prepare the figures, charts and graphs separately from the text files. In general, article should contain title page, abstract accompanied with key words, introduction, materials and methods, results and discussion, conclusion, acknowledgement (if any) and references. The title should be concise (not more than 14 words) and informative. Please clearly indicate the given name(s) and family name(s) of each author. Present the authors’ affiliation addresses below the names. Clearly indicate who will handle correspondence at all stages of publication by presenting his/her e-mail address. The abstract should state briefly (100-200 words) the objectives of the research, methods used, the principal results and main conclusions. References and uncommon abbreviations should be avoided from the abstract. Please state 3-5 keywords below the abstract. For article in Bahasa Indonesia, abstract should be written both in Bahasa Indonesia and English. State the background and objectives of the research. Avoid a detail literature review or summary of the results. Provide sufficient detail methods to allow the work to be reproduced. Methods already published should be indicated by a reference. Only relevant modifications should be described. Please state specific material and equipment used in the research, including the sources (e.g., company’s name, country). Results should be clear and concise. Discuss the significance of the results of the work. Avoid extensive citations and discussion of published literature. Present the conclusion which is the answer of research questions in a short paragraph. List here those who provided help during the research (e.g., financial support, helpful discussion, data analysis, etc.). Please ensure that every reference cited in the text is also present in the references list (and vice versa). Citations to these references will be formatted according to the journal style. Where applicable, author name(s), journal/book title, article/chapter title, year of publication, volume number/book chapter and the pagination must be present. Please format the references according to the Vancouver style as illustrated below. Previous study  has recently shown that -----------. Moreover, Yunita et al. found that -----------. Jamu, an Indonesian indigenous herbal medicine, has been used since ancient time . Avanti C, Oktaviani NA, Hinrichs WL, Frijlink HW, Mulder FA. Aspartate buffer and divalent metal ions affect oxytocin in aqueous solution and protect it from degradation. International journal of pharmaceutics. 2013;444(1):139-45. Yunita O, Yuwono M, Rantam FA. In vitro cytotoxicity assay of Sauropus androgynus on human mesenchymal stem cells. Toxicological & Environmental Chemistry. 2013;95(4):679-86. Sutarjadi, Rahman A, Indrawati NL. Jamu: Obat asli Indonesia pusaka leluhur warisan nasional bangsa. Jakarta: PT Gramedia Pustaka Utama; 2012. Please supply figures separately from the text. Please save as or convert the image to the JPEG or TIF files. Ensure that each figure has a caption. Supply captions separately, not attached to the figure. A caption should comprise a brief title and a description of the illustration. Please submit tables as editable text and not as images. Tables can be placed either next to the relevant article, or on separate page(s) at the end of the text. Number tables consecutively in accordance with their appearance in the text and place any table’s note below the table body. Please avoid using vertical rules.